Full Motion Antennas designed and built by Vertex Antennentechnik (VA) offer very wide continuous travel ranges, high pointing/tracking accuracies and are suited for Multi Mission Operation for TT&C and remote sensing applications. Full Motion Antennas are equipped with electrically torqued drives in azimuth and elevation, and for some models also in the tilt axis. High angular velocities in azimuth in combination with the tilt angle safeguard continuous transmission and reception towards LEO spacecrafts with orbital altitudes down to 400 km above the earth. The servo & drive and tracking system provides various operating modes such as program track or auto track with polarization diversity in multiple bands. VA supplies TT&C packages for S and X-band including base band unit or remote sensing packages with high data rate demodulators in X or Ka-band. Very precise time synchronisation and reference frequency generation is accomplished by means of a GPS driven time reference System. Antennas can be equipped with electrical reflector heating systems comprising infrared heating rods integrated into the reflector panels; thus the power consumption can be reduced by heating sectors only. Remote control by means of a pass scheduler option in monitoring system (M&C) is conducted via serial/LAN interfaces. 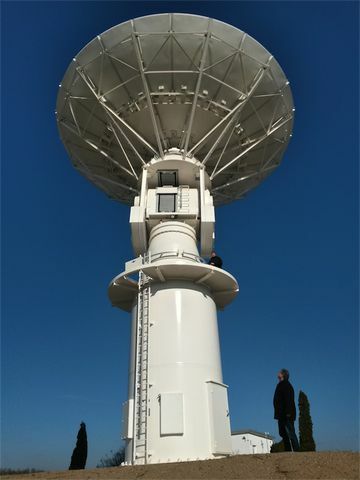 The lower tower section offers rack space for the RF subsystems and base band equipment and remote sensing receivers or customer furnished equipment. The antenna support/tower can be a steel or reinforced concrete structure. Program Management, in-plant integration, shipping, installation, commissioning, acceptance testing, maintenance, after sales services are substantial activities, qualifying VA as a world-wide supplier of turn-key ground stations and antenna systems for LEO applications such as remote sensing or TT&C. The product range consists of antennas between 3 and 20 meter in diameter.